Brown is a research university that regards the creation of knowledge as one of its fundamental missions. Our faculty and students work at the cutting edge of research in their fields and collaborate with colleagues across disciplines and around the world to address society's biggest challenges. The Office of the Vice President for Research advances the research enterprise at Brown by supporting our faculty and students in all aspects of their research activities from the conception of new ideas through the dissemination of the knowledge they create. We help fund new funding opportunities, prepare proposals, comply with regulations, manage awards, and commercialize research discoveries. 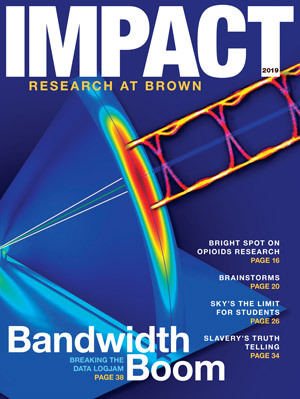 Impact: Research at Brown is Brown’s magazine devoted to the University’s research. Read the magazine for stories of groundbreaking discovery and scholarship, and of our commitment to making a difference in the world.